quite interesting. I've tried to do something similar (e.g. 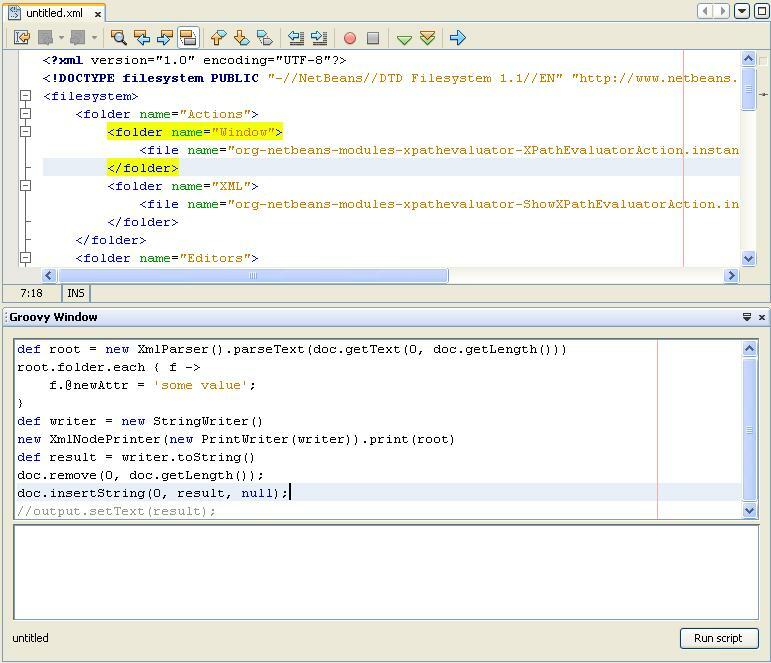 embedding a groovy console inside NetBeans, but I ran into some issues doing so, see details at http://www.nabble.com/Groovy-Editor-%3A-exposing-packages-from-groovy-all.jar-as-public-packages-td20287396.html#a20287396). Would you consider posting the source code to your module ? I don't use Groovy Console in my sample. I just run some code using GroovyShell. I will post the source code after I cleaned it. Sometime on weekend. If you can't wait until then you can download XPathEvaluator module and extend it with Groovy specific code. You need to download Groovy And Grails plugin and include groovy libs (implementation version) in project.